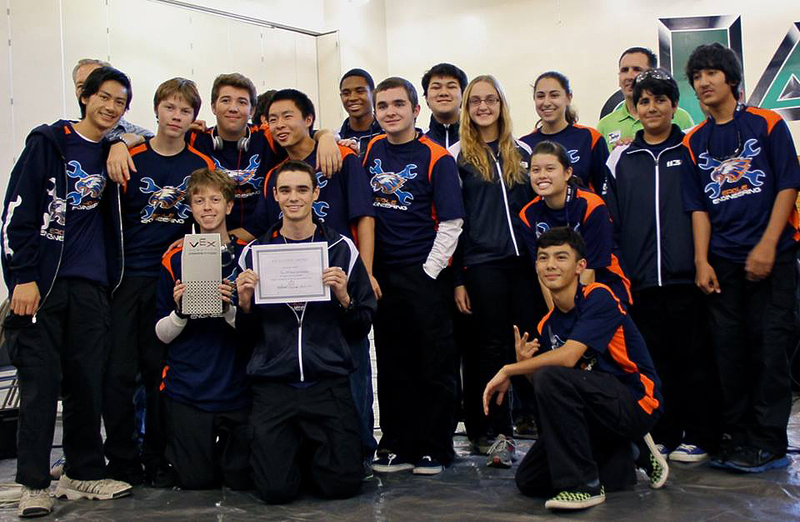 Chaminade’s Eagle Engineering Robotics Team 1138 perpetuated their winning tradition by taking the Excellence Award at the California Academy of Math and Science Vex Invitational robotics tournament at Cabrillo High School in Long Beach this weekend. This was their second year in a row earning top honors at this event. The team delivered a solid performance, finishing third in the qualifying rounds at 5-1. They then carried their three-team alliance through the semi-finals against some very tough competition. The Excellence Award is considered the highest honor in Vex Robotics Competition and goes to the best overall team in robot performance as well as all judged categories. Cited in their award presentation were the effectiveness of their robot, a solid team approach to design and construction, and most notably an impressive exhibition of programming prowess. This award qualifies the team for the California High School Vex Robotics Competition State Championship to be held in Santa Clara, March 14-16 ‑ the next step in their goal to return to the World Championship in April. Team 1138 Sponsors include Xerox, Boeing, Aerojet/Rocketdyne and HBO. This entry was posted in Academics, High School, Robotics, Science by Chaminade News. Bookmark the permalink. “…impressive exhibition of programming prowess,” I am honored to know some of these programmers. Way to go 1138!